Rev. 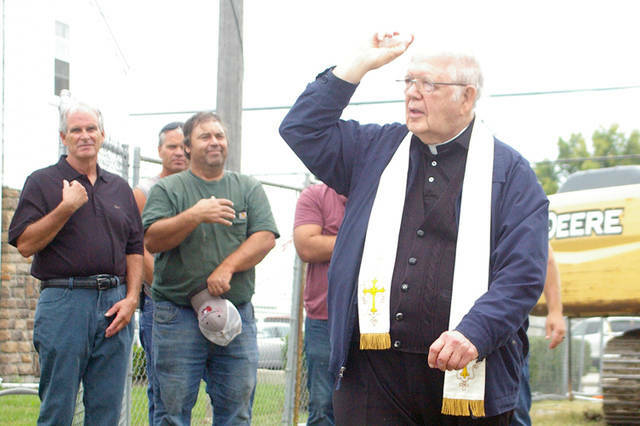 Charles Mullen from St. Charles Senior Living Community in Carthagena blessed the grounds of Do Good Restaurant and Ministry on Wednesday morning in Osgood. A groundbreaking ceremony was held Wednesday morning for Do Good Restaurant and Ministry in Osgood. Pictured (l-r) are Matt Hibner, from Garmann Miller; Cindy Pottkotter, from Garmann Miller; Karen Homan, owner of Do Good; and Matt Quinter, from Baumer Construction. OSGOOD – Karen Homan said the voice of God compelled her to open a restaurant and ministry. 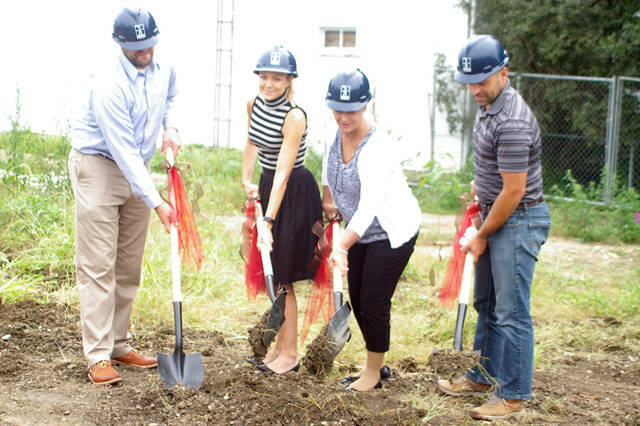 That vision took a major step forward Wednesday morning with a groundbreaking ceremony for Do Good Restaurant and Ministry at the site of the former Silver Spur restaurant and bar in Osgood. Homan first heard the call to open the restaurant and ministry and a year and a half ago, she said. After seeing more signs, she proceeded with plans to open Do Good. Do Good will serve American cuisine using as many whole foods as possible. It will feature comfort foods and desserts. Ministries will be housed in the basement of the establishment and will be free to the public with funding coming from profits of the restaurant. Homan doesn’t have any experience running a restaurant, but she’s been encouraged by the support the community has shown throughout the endeavor. Garmann Miller provided the architectural design of the building, and Baumer Construction will be the general contractor. Rev. Charles Mullen from St. Charles Senior Living Community in Carthagena blessed the land before Homan and representatives from Garmann Miller and Baumer Construction broke ground. Construction is anticipated to take eight or nine months with Homan hoping to open the Do Good doors in late May or early June in 2019. The restaurant will include quiet mentions of God’s word, Homan said, but patrons will know his presence. “He would show me things to do to draw people closer back to him,” she said. This entry was tagged Do Good, Do Good Restaurant and Ministry, groundbreaking, Osgood, restaurant. Bookmark the permalink.